Another way we use words is for praising God and telling others the Good News. That is good. That is as it should be. But what about the times we are going about our life, talking about or praising God, then in a snap something happens to change the course of our words. I confess this is something I battle… when I drive! I’m going along, minding my own business, driving correctly and within the confines of the law (honest! ), listening to K-Love and singing to and about God. Then another driver does something to irritate me and all of a sudden I’m no longer praising God. All of a sudden, my mouth goes from being an instrument of life to an instrument of death. Now, I’m not actually speaking profanity, but it is cursing nonetheless. Does the Bible mention this? Of course it does! In James 3:9-10, we find, “With the tongue we praise our Lord and Father, and with it we curse men, who have been made in God's likeness. Out of the same mouth come praise and cursing. My brothers and sisters, this should not be.” (Emphasis mine.) I am working on this, and in truth I’ve gotten much better, but I know I have to remain diligent in this or I will easily slip back into a pattern of cursing others. On Friday, September 26th, 2008, Hollywood, all of America and the world, lost a treasured and deeply respected man. Paul Newman was 83 years old, when he succombed to his battle with lung cancer. Normally I don’t write about celebrities, but Paul Newman was anything but a normal celebrity. He was Hollywood royalty, but that in and of itself means little. In a town where “till death do I part” usually means till I get bored, Paul Newman and his wife Joanne Woodward were married for 50 years. When asked about infidelity, he quipped, “Why go out for hamburger when I’ve got steak at home?” Throughout this long marriage, they both appeared to genuinely love, respect and enjoy each other always. He had 6 children, 3 (1 son who died from an accidental drug overdose and 2 daughters) from his previous marriage and 3 (daughters) with Joanne Woodward. Paul served in the Navy during WWII. He became a professional race car driver in the 1970’s and actually did well at it. Paul was a political activist and while I personally disagree with his stance on many issues (particularly gay marriage), I wholly appreciate his class and honor in how he represented himself on sharing his beliefs. Paul was also known for his philanthropy. He was not a celebrity who merely lent his name to draw attention to a cause. He did something about it and he did it big. Philanthropically, he is best known for his Newman’s Own line of food products, which donated all proceeds after taxes to charity. As of early 2006, this amounted to more than 200 million dollars. He is lesser known for co-founding the Hole in the Wall Gang Camp in 1988, which is a summer camp for seriously ill children. One camp has expanded to become several Hole in the Wall Camps in the U.S., Ireland, France and Israel. The camp serves 13,000 children every year, free of charge. Paul Newman was a prominent American. He was a distinguished actor, a loving and devoted husband and father, a great humanitarian; he loved life and lived his to the fullest. I don’t know his standing with God, but I sincerely hope that he was right with Him. He was truly a class act. And he will be missed. Thank you, Paul, for the good works and the memories. It’s Saturday once again! And that means it’s time for another Super-Sarah Saturday post, with illustration of Republican Vice-Presidential nominee Sarah Palin. Whether you like her or not, it’s hard to deny the impact she’s had in this election. Go Sarah! It is time once again for Friday Fiction, this week hosted by Joanne at her An Open Book blog. This was another entry in the FaithWriters Weekly Challenge. If you would like to read more great fiction, or participate, please go to Fiction Friday. I hope you enjoy the story. Ugh, thought Brandy turning off the radio, the frustration she felt showing in her body language. The last thing I need is to hear Reba singing about her phone not ringing – like someone would ever not call her. She picked up her cell and dialed her best friend Kellie. “Oh, not much, just sitting here stewing. He still hasn’t called. We went out three days ago and I thought we had a good time. Ugh, why hasn’t he called, and why can’t I call him?” Brandy knew it sounded like she was whining, but she didn’t care. “Brandy, you know how it is. If you call a guy, it looks like you’re desperate. And you’re not desperate, and if you are, well, you shouldn’t show it, you’re only 22 for pity’s sake! Besides, you shouldn’t be waiting by the phone anyway, go out, have fun and forget about him. If he doesn’t call it’s his loss, not yours”, said Kellie, talking in a way only a best friend could. “I’m not desperate! And I’m not ‘waiting by the phone’. It’s a cell, so it goes with me. Duh! I just thought we both had, you know, fun. I guess maybe I had more fun than he did”, said Brandy sounding dejected. “That doesn’t even make sense, you know. Besides if Bell didn’t invent the phone we wouldn’t be talking right now,” said Kellie laughing. “I know, but that’s how I feel. I swear, I’m so done with guys. Maybe I’ll just become a nun, and I’ll marry God and never have to worry about dating or the phone ringing again,” Brandy said with frustration in her voice. “Yeah, ok… uh, hold on, my other line is beeping,” said Brandy switching lines. “Oh, I’m sorry, I forgot. But he’s so cute and cool and fun and I really like him! You understand right?” Brandy asked. “Yeah, I understand. Boys are for now, friends are for always. I get it.” Kellie tried to sound like she was supportive, but really she was bummed. She’s so boy crazy, Kellie thought. Stupid boy, stupid phone, stupid second date! Now what am I going to do? ‘Ok, thanks! I gotta go, he’s on the other line. I just love the phone and that Bell guy that invented it! Bye!” Brandy gushed as she clicked over, leaving Kellie looking blankly at the disconnected phone in her hand. I’m so glad that every day is new and fresh and another opportunity to love and worship our Lord. ALL THESE NUMBERS MAY BE CALLED DIRECTLY. I have decided to change the look of my blog with the help of Lena at Simply Fabulous Blog Templates. I have now begun the process of making the change. It will take me some time to get all of the sidebar and widget content replaced and organized. 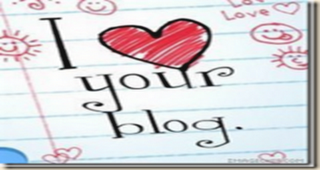 For those of you whose blogs I follow and list in my blogroll, I think I will have you re-listed shortly. If you notice that your blog may be missing, please let me know, as it is simply an oversight. Thank you for your patience. Blessings to you! As most would probably guess, I am an ardent conservative, Republican patriot and as such, I am absolutely delighted with John McCain's pick for his Vice-Presidential running-mate, Sarah Palin. She is a breath of fresh air in the world of American politics. Recently a friend sent me an email containing several pictures depicting Super-Sarah, and I'll be sharing them all in the coming weeks. I enjoyed them very much and hope you do too. Enjoy! ~ A beautiful, happy and healthy daughter. ~ Her laughter and squeals of delight. ~ The sweet singing that awakens me each morning. ~ The long cuddles and hugs she gives me following her waking from bedtime or naptime. ~ The beautiful smile that lights up her face, the room we’re in and my own heart. ~ A depth of love I never before knew existed. And I am especially thankful to the Lord, for this amazing and perfect gift that He has entrusted me with. I’m so excited to begin this new “Choose Life” series. When God created us, He gave us freewill – the ability to choose between right and wrong, life and death, blessings and curses. There is much power in choice, power we have for the life we live. Every day we choose the direction of our life by what we think, say and do, by the relationships we’re in, and by the attitudes we hold. All of these choices lead to life or death. Choosing life is a journey, not something we do once and it’s finished. It’s ongoing. It’s powerful. And, choosing life, or death, is up to us. Let’s be honest, it’s a tough world out there. We are constantly hit by a barrage of words, images, attitudes and expectations that imply we are not good enough, thin enough, rich enough, smart enough, pretty enough, successful enough, etc. Many of us have experienced this onslaught since we were children. Since this has been our experience, we often adopt and internalize all of this and begin the harmful process of attacking ourselves and others with it. Our thoughts are then naturally polluted by the garbage that has been swirling around about us. Whether it is depression, bitterness, envy, anger, hurt, malice, hatred, obscenity, a victim mentality or sense of worthlessness, thoughts like these lead to destruction and if we entertain them, ultimately they lead to death. It doesn’t matter if these thoughts we think are about ourselves or others, either way we are choosing death. In order to have a thought life that is life-giving, we have to understand where it comes from. Everything good comes from God (James 1:17). It is He who gives life, and everything that leads to life. And He has given us His Word and Holy Spirit, to guide us on the path of life. When we study, and personalize the Bible, we come to understand who we are in Christ. When we know who we are in Christ it is easy to recognize thoughts that enter our mind that are not of Him. It says in 2 Cor. 10:5, “We demolish arguments and every pretension that sets itself up against the knowledge of God, and we take captive every thought to make it obedient to Christ.” When we recognize those thoughts and take them captive, rather than letting them run free, we are choosing life. Whenever we have negative thoughts we need to overcome them and put them to death, by replacing them with positive thoughts. If we find ourselves thinking, I’m ugly, we need to stop, take that thought captive and say, No, I’m beautiful. Or if we have the thought, I’m not good enough, we need to counter that by saying, I am good enough, God made me good enough. When we got saved, we received not only our salvation, but other things too. One of the additional “benefits” we received was the mind of Christ (1 Cor. 2:16). The only way to know the mind of Christ is to know Christ, through the Word, through worship, through prayer and through relationship. What does He say about us? How does He relate to others? What would He do in this situation? And then we should model ourselves and our thoughts after Him. We must be diligently aware of the thoughts we think. We must get the Word of God inside of us. We must learn what God says about us. We must choose incessantly, to think the thoughts that lead to life. We are admonished in Phi. 4:8, “Finally, brothers, whatever is true, whatever is noble, whatever is right, whatever is pure, whatever is lovely, whatever is admirable – if anything is excellent or praiseworthy – think about such things.” This is how we choose life in our thoughts. I am so grateful to have been welcomed into the family of God. The love He has for us is astounding. 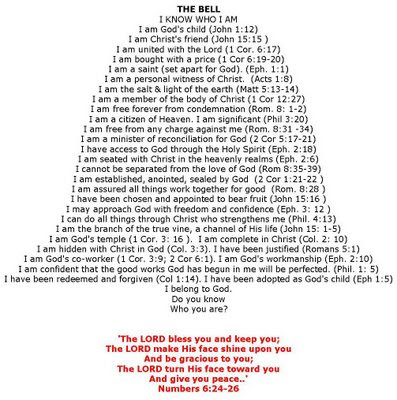 Because of Him, I am a daughter of the King, an heir of God and joint heir with Christ. Because of Him, I am righteous and holy. Because of Him, I live. Hallelujah! Isn’t this a beautiful illustration? One that I can’t take credit for, that’s for sure. I actually borrowed this from Amy at her Mom of 4 Saved By Grace blog. It is so important to know who we are, in Christ, so we can stand strong and not falter in this world we are in, but not of. I hope you enjoy this as much as I have. Blessings! I am so excited to be blessed again with another wonderful blog award. This time I was awarded the “I Love Your Blog” award, by two very special women. 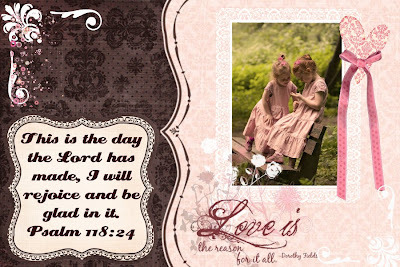 Lori at her Persevere blog and Valerie at her Simply 4 God blog are both are amazing women of God and I am blessed that we are bloggy friends. If you are not familiar with their blogs, I encourage you to check them out, because they both are the real deal. God’s Word and Wisdom resides in them completely. Thank you Lori and Valerie, for this blessing you’ve given me. I am honored that you thought of me. You both have such amazing blogs, and I take away wonderful nuggets of Truth and Wisdom every time I visit. May God bless you both richly for your faithfulness. I remain humbled and grateful that God uses my words to touch others. He really does deserve all the glory. As always, it is my hope that my words and my blog encourage others in their daily lives. I strive to be real and relevant, though am not above doing something just for fun once in awhile. I am beyond blessed to have found this wonderful blogging community where we can, and do, encourage and support one another regularly. ~ God’s love, which He had for me even when I was unlovable. ~ God’s grace, which He offered freely to me (though I didn’t deserve it), but cost Him so much. ~ God’s mercies, which are new, and needed, every day. ~ God’s Word, which is my lifeline to Him, and gives me hope, comfort, wisdom, encouragement and direction at all times. ~ God’s patience, which allows me to stumble while growing in Him, without fear of being abandoned or rejected by Him. 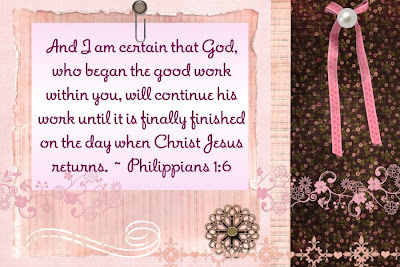 ~ God’s promises, which I have seen fulfilled in my own life many times. ~ God’s faithfulness, which has proven time and again that my trust in Him is well placed. ~ God’s provision, which has taken care of all of my needs and lots of my wants. ~ God’s handiwork, which I see in my own life, and that Jeff’s and Sweet Pea’s, as well as in the beauty and majesty of nature. ~ God’s Son, who didn’t have to come and die for me, in a horrible and torturous way, to save me from the pit I was in, but chose to because He thought I was worth it. I am so grateful that God, in His most amazing grace, does forgive us and welcome us into the shadow of His wings, when we turn from our sins and humbly come to Him with a repentant heart. Sometimes I think we have a more difficult time forgiving ourselves, but it is important that we do so. If we don’t forgive ourselves when we’ve done something wrong, but God has forgiven us, it’s like we’re elevating our forgiveness above His. In order to have the abundant life and freedom in Christ that He has for us, we must release any unforgiveness we may be holding, whether it is against someone else or ourselves. On August 4th, I announced that it was time for me to do another series and that after much prayer and reflection I knew the topic for the new series would be “Choose Life”. I announced this, confident that I would be able to put out some devotional-type articles relatively easily because this is something I so strongly believe in. Oh, how wrong I was. I am working on this and I will put together a series, but I have been held up by the Lord. It’s very easy to make excuses about it – all of a sudden life got very busy for me, Sweet Pea was sick for nearly two weeks, then I was sick for nearly two weeks, we had another miscarriage, went on vacation, and finally came home and worked on getting caught up with things after being on vacation. All of this is true; however I also know that they’ve been convenient excuses to perpetuate avoidance. What has really been going on, is a wrestling match with God. See, I thought I had it all planned out in my head, but it would seem that He had something else in mind. So, I guess you could say I have been experiencing first hand Proverbs 19:21, “Many are the plans in a man’s heart, but it is the Lord’s purpose that prevails.” And I’ve learned that when it comes to wrestling with God, I don’t win unless He wins first. This began when I posted my intentions to do this series. A friend, Michelle, on GodLinked.com nearly missed my post and suggested I start a discussion about it, so it could be easily found and discussed. I thought this was a great idea, so I did so. I briefly summarized what “Choosing Life” meant to me and asked others to add what it meant to them. I got great responses from various readers, and then there was “the one.” Michelle responded and said that for her, choosing life was first and foremost about choosing life in pregnancy and contributed a FANTASTIC and heartfelt plea for the unborn. Wow! I felt like I’d been hit by a truck, because I have to admit, I never once put the idea or Scripture of choosing life together with the Pro-Life cause. Not that I didn’t share those beliefs though, because I do. I am wholly, 100% Pro-Life, but for some reason linking the cause with the verse just never occurred to me. Thus began the wrestling match. I knew I couldn’t pursue this topic until I first included this most important aspect of it. However, I didn’t really want to. The topic of abortion is controversial (but that doesn’t bother me), emotionally draining and one of our nations (and the world’s) greatest tragedies. Did I really want to delve so deeply into satan’s territory? Though I fought it hard, in the end I knew the Lord was right and I absolutely had to start with this. Since Roe v. Wade was decided by the Supreme Court in 1973, nearly 50 million babies have been aborted. Liberals would have us believe that it is harmless. No one gets hurt. It’s not a baby anyway until it is born – it’s just a fetus. This couldn’t be further from the truth. Please get the facts. Find out about abortion, partial-birth abortion (it is hideous), Planned Parenthood (and Margaret Sanger, founder of PP), and the Born Alive Infant Protection Act (to give medical care to a baby born alive after a botched abortion – Obama voted against it). There are some fabulous sites out there that can give you information on all of this and more. I am completely Pro-Life now, but I wasn’t always. I grew up in the 70’s (childhood) and 80’s (teen years) and didn’t have a lot of Christian influence in my life. When I was an early adolescent, my mom told me “even good girls get pregnant”. I’m not sure why, but I understood that to mean that teenage pregnancy wasn’t a big deal. When I was 19 years old, I did get pregnant. And I got an abortion. I didn’t even give it much thought. I believed the lies, that it wasn’t a baby until 12 weeks, it (the baby or fetus as they called it) wouldn’t feel any pain and that I would be better off. The small amount of thought that I did give it all seemed to point to what would be an easy fix. I had been partying really hard, nightly, and recently broken up with the boy who was the father. He was an awful person, so I wouldn’t want to be tied to him anyway. I grew up in a dysfunctional home with a single mom and didn’t want to inflict on any child the things I’d gone through. I thought abortion was the only way. I received no counseling contrary to that. In that moment, in the worst possible way, I chose death. During that time of my life, I was in a really bad place. I hated myself, hated my life and wished I’d never been born. I was completely surrounded by darkness and I truly believed the best way to save the child within me was to not allow it to be born. It was my desire to save it from the life I’d had. So I chose abortion, murder, homicide, infanticide, whatever you want to call it, it is death forced on another innocent soul who didn’t ask to be conceived in the first place. I never thought of the blessing it could have been. I didn’t take responsibility for my actions. I just chose death. Liberals and feminists say abortion is harmless, but that’s not true. This is something I have carried with me for 20 years. I have thought of this innocent child I killed many, many, many times since. It is my greatest shame, greatest regret and greatest moral failure. I felt this way ever since it happened, long before I became a Christian. I’ve heard many other women who’ve gone down this road, say the same or similar things. God’s grace has strengthened me and covered me. His love has shown me what love really is. He has changed me completely. And it is He who gives me the ability to choose life. I know someday I will see my unborn children in heaven – all three of them. Previous to this post, I’ve talked about the one, then two babies I’ve miscarried that are in heaven. Though I always thought about it, I’ve never mentioned the third. Here and now, I do. Christians, please pray for life. Pray that the lie of the enemy will be exposed. Vote for those who are Pro-Life and against those who are Pro-Abortion. And be compassionate to those who are contemplating abortion. They need love, not criticism and support not judgment. And if the Lord leads your heart to help in some way, please do so. There are many great ministries and organizations that could use your time, talent or treasure. This is the best way to Choose Life. “Oh Mom, it hurts so bad!” Mallory was lying on her bed, crying into her pillow. At eighteen, her first broken heart was a very big deal. Her mother, Valerie, was sitting beside her, rubbing her back. “I know it does, Sweetheart. Can you tell me what happened?” Valerie responded to her daughter with a tenderness that indicated she really did understand. She and Scott had been hearing things and thought this time might be coming. “People change, Honey. Sometimes that change is for the better, and sometimes it’s for the worse. Your heart is breaking right now and I wish I could take that pain away, but I can’t. I want you to know though, how proud your dad and I are, that you know who you are and stand firm on your beliefs.” Lord, give me the words to comfort her, Valerie prayed silently. “Mom, I know people change, but I didn’t think Blake would. I mean he’s Pastor Morgan’s son. He was going to be a pastor too! We were going to go to college, get married and have a church of our own. Now it’s all ruined and my life is over!! !” Mallory’s crying intensified as she thought of the shattered dreams. “See, I had my plans, but God had his. Two years after this other boy, I met your dad and I knew, really knew that he was the one for me. Two years after that, we got married. Two years after that, you were born. If I hadn’t met your dad, I wouldn’t have you.” Valerie pulled her daughter up so they were sitting face to face. “You will get through this, I promise,” said Valerie as she hugged Mallory. “It doesn’t feel like it,” Mallory sniffled as she hugged her mom back. “I know, but you have to trust me on this. You had your plans, but God has plans for you too, and His are always the best. He has your future in His hands and that includes the husband and children He’s picked for you.” Valerie smiled then, and pushed the bangs out of Mallory’s eyes. “So what am I supposed to do now?” Mallory asked as she took a deep breath. I was reading a thread in a Christian forum today (on FaithWriters) regarding the upcoming Presidential election. I was shocked at a certain girl’s extremely mean-spirited and ill-informed opinions. One of the nasty things she had to say about John McCain (along with that he is an atheist, which he definitely is not and other such things) is this, “McCain cheated on his wife [my note: meaning ex-wife and btw, ex-wife is promoting and presumably voting for John] and asked her for a divorce so he can marry a barbie doll. (my source came from wikipedia if anyone is interested)”. Needless to say, this incensed me greatly and I found I had to respond. The following was my response. As a person from Phoenix, I can assure you I am proud of and admire this “Barbie doll” very much. It would be great if the rest of us would put our money, and our actions, where our mouths are. Yes, she is an heiress, but her father grew up poor, worked hard and created his wealth. He too was a war hero, serving in WWII and being shot down multiple times. It seems as though the McCain family actually lives the Scripture Luke 12:48, “To whom much is given, much is expected.” Yes this post is very long, but informative should you choose to read it. This info was verified through Snopes. There was an article recently in the Wall Street Journal on Cindy McCain, John’s wife. Most people only ever see an attractive woman standing beside John. It may be surprising to them how talented and involved with world problems she is. This is a summary of that article. She graduated from Southern Cal and was a special-needs teacher. After her Dad died she became involved with his beer distributing firm and is now the chairwoman. Sales have doubled since she has taken over from her father. They have a marriage prenuptial agreement, her assets remain separate. She is involved around the world clearing land mines – travels to these countries on a detonation team and serves on their board. They have a 19 year old son serving in Iraq, and another son in the Naval Academy, a daughter recently graduated from Columbia University, an adopted daughter in high school, and a son who is the finance guy at the beer firm. They raised their kids in Phoenix, rather than D.C and he commuted. In 1991, Mrs. McCain came across a girl in an orphanage in Bangladesh. Mother Teresa implored Mrs. McCain to take the baby with a severe cleft palate. She did so without first telling her husband. The couple adopted the girl who has had a dozen operations to repair her cleft palate and other medical problems. They have a Family Foundation for children’s causes. She’s active with “Halo Trust” – to clear land mines, provide water and food in war ravaged and developing countries. She will join an overseas mission of “Operation Smile”, a charity for corrective surgery on children’s faces. She has had two back surgeries and became addicted to pain killers. She talks openly about it which she says is part of the recovery process. Personally, I’m not surprised the media is so quiet about her attributes. They have tried to discredit John McCain because of his wife’s wealth. It looks as if she knows how to put money and time to use in many good causes. What a novel thought to have such a fine person as the “First Spouse”. She sounds more capable than Hillary or Obama. If John McCain gets elected, we would really get two for the price of one. A person with business and international experience. Election 2008: Cindy Hensley McCain has been disparaged as a trophy wife, a Barbie, an heiress with fancy purses, even the Paris Hilton of politics. But there's more to the picture than meets the eye. Yes, Mrs. McCain is the perfectly coifed blonde standing dutifully behind the senator during his speeches. And yes, she wears stylish clothing and carries a Prada purse. And it's true she doesn't say much. But feminist critics who write her off as a 'stand-by-your-man' shrinking violet are selling her short. In many ways, Cindy McCain stacks up sturdier than Hillary Clinton or Michelle Obama. And she'd make a more impressive first lady. Mrs. McCain: More than meets the eye. While Obama's wife has been hating America, complaining about the war and undermining our troops serving in Afghanistan, McCain's wife has been worrying about her sons who actually are fighting or planning to fight in the war on terror. One, in fact, was until a few months ago deployed in Iraq during some of the worst violence. You don't hear the McCain's talk about it, but their 19-year-old Marine, Jimmy, is preparing for his second tour of duty. Their 21-year-old son, Jack, is poised to graduate from Annapolis and also could join the Marines as a second lieutenant. The couple made the decision not to draw attention to their sons out of respect for other families with sons and daughters in harm's way. Cindy also says she doesn't want to risk falling apart on the campaign trail talking about Jimmy who was so young when he enlisted she had to sign consent forms for his medical tests before he could report for duty and potentially upsetting parents of soldiers who are serving or have been killed. The McCain's want to make sure their boys get no special treatment. Same goes for their five other children, including a daughter they adopted from Bangladesh . During a visit to Mother Teresa's orphanage there, Cindy noticed a dying baby. The orphanage could not provide the medical care needed to save her life. So she brought the child home to America for the surgery she desperately needed. The baby is now their healthy, 16-year-old daughter, Bridget. Though all seven McCain children including two Sen. McCain adopted from his first marriage are supportive of their father, they prefer their privacy to the glare of the campaign trail. Another daughter, Meghan, 23, helps him behind the scenes. Cindy McCain not only cherishes her children, but also her country, which in an election year filled with America-bashing, is a refreshing novelty. She seethed when she heard Michelle Obama's unpatriotic remarks that she only recently grew proud of America . 'I am very proud of my country,' Mrs. McCain asserted. She also may be tougher than the other women in the race. While Hillary thinks she's come under sniper fire on mission trips abroad, Cindy has actually seen violence. She witnessed a boy get blown up by a mine in Kuwait during a trip with an international group that removes land mines from war-torn countries. Mrs. McCain also is a hands-on philanthropist. She sits on the board of Operation Smile, which arranges for plastic surgeons to fix cleft palates and other birth defects. She also has helped organize relief missions to Micronesia . During a scuba-diving vacation to the islands, Mrs. McCain took a to a local hospital to have a cut treated. She was shocked, and saddened, by what she saw. 'They opened the door to the OR, where the supplies were, and there were two cats and a whole bunch of rats climbing out of the sterile supplies,' she recalled. 'They had no X-ray machine, no beds. To me, it was devastating because it was a U.S. trust territory.' As soon as she returned home, she arranged for medical equipment and teams of doctors to be sent to treat the island children. Michelle Obama may contribute to CARE, which fights global poverty and works to empower poor women. Cindy sits on its board. While the Democrat women talk about helping the poor and needy, Cindy McCain actually rolls up her sleeves and does it. Who's the out-of-touch elitist? We returned from our wonderful family vacation Sunday night. As you may recall, we were blessed to be able to leave the heat of the Phoenix area to spend a week in the awesome Lake Tahoe area. It was beautiful and amazing and restful, not to mention cooler than we’re used to in the Valley of the Sun this time of year! To me, there really is something special about being surrounded by nature and I always feel closer to God when I am. We really enjoyed the friendly blue jay that frequently visited our balcony and occasionally came in our room. Though I must admit, the numerous “beware of bears” notices were a bit disconcerting. This vacation was the first for our little Sweet Pea and the first for us with her. She is nearly a year old now and while it was definitely more work to vacation with a baby, it was also more special in lots of ways. It was a time of many firsts for her. For the first time she felt pine needles and rough tree bark, sat in grass, stood in a lake, had a couple of french fries, lay in a hammock (with Daddy, of course! ), went down a slide, rode in a swing, and went on a bike ride. Unfortunately, we couldn’t stay indefinitely. As usual, when it came time to leave, I didn’t want to come home. And yet I was so happy to get home. I’m an odd duck, I know. It was great to see our 4-legged family again and to sleep in our own beds. But, it was hard to leave such beauty, cool temperatures and relaxation. However, we came home feeling refreshed, rejuvenated and reconnected as a family again. In short, it was fantabulous!